I don't know if anyone really cares about this, but to me it's a super big deal. 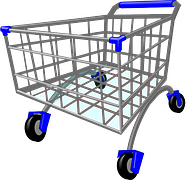 Most grocery stores have a policy that they aren't responsible if a cart damages a vehicle. If this is the case, then why do so many people refuse to take the cart back in the store, or put it in the cart holder? On any given day at Wal-Mart, Food Lion and more, there are wayward shopping carts all over the parking lot, just waiting for that little bit of wind to cause one to viciously attack a car. Am I alone in my rant? How come no one seems to get along on reality television shows? The backstabbing, mean comments, hair pulling and champagne throwing is a regular thing. How come a 16.oz bottle of Coke or Mountain Dew, etc. is $1.59 or more, and the 2 Liter Bottle is $.99? Something is very wrong with that. You've been wearing the same size shoe like forever, and decide to try a new shoe store. You find a shoe that's totally perfect and purchase it without trying it on. How about when you get home, that dang shoe is either way too big or way too small. What the heck? Several years ago, I took a quick day trip from Virginia Beach to NC, and found these wonderful purple shoes(yep, that's my fave color). Intent on picking up some hot wheels, I grabbed those shoes, paid and ran out the door to my next adventure. A little while later, I made the 2 hour drive home and realized I had 2 left shoes!!!! Does that sound crazy or what? (lol) Valuable lesson learned. I love Valentine's Day, and have found that this day of love is definitely more focused on us women, and men aren't all that into it. This, of course, is yet another reason for more chocolate, which I'll never turn down, but I'd be super thrilled if I received a gift card to Barnes and Noble, a romantic card, and a cheeseburger with unlimited fries from Red Robin. (lol) I've also run into a few people who break up a few days in advance so they don't have to get gifts. *heh* What about you? Any plans for heart day this weekend? RO, you had a lot on your mind today (smile!). Have a wonderful weekend and Happy Valentine's Day!! Here, you need a coin to get the grocery cart, and you only get your coin back if you put the cart back in place :) Problem solved. We don't celebrate Valentine's Day anymore. I don't see it as a real holiday. 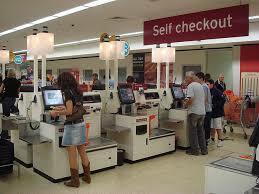 lol Those self check out registers are so annoying. Happy Valentine's day to you, Ro! I don't drive so i don't know about the shopping cart thing, though you are right there is always stray carts all over. soft drinks - prices can differ depending on sales. Happy valentines day, remember to show yourself some love. Haha, my ex-husband got a dent in his car at a grocery store once. The next time he saw some lazy person not putting her cart away, he yelled at her. Back before online grocery shopping, I always went to extra effort to put my cart up, but I will say that some stores don't make it easy. They put very few cart stables (or whatever they're called) out in the parking lot so you have to walk a long way. I do it...but I can see how a lazy or maybe less able-bodied person might not go to that trouble. I've shopped at some stores where the only cart stables were way at the very end of the lot, so you either had to walk all that way or take it back inside the store. The carts drive me crazy! It's not like they don't have cart returns all over the parking lots. Oys. But I have a similar rant about items in the grocery store. Like when someone grabs milk then decides eh and leaves it in the cereal aisle. Jerks! 2 left shoes story made me laugh a lot. They might have been dazzling that you haven't noticed 2 left shoes.